To play and stay at the Windsor Golf Hotel and Country Club is an unforgettable experience. The resort has an overpowering impact which is difficult to prepare for as it was designed to recall the early days of Kenya's aristocratic British pioneers and to compare with names like The Savoy, Claridges and Gleneagles. There is a little piece of each here at Windsor. 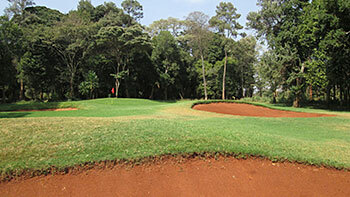 Some say the golf course is one of Africa's very best, designed by Tom Macauley to championship standard and length which threads through forest and coffee farms quite beautifully. There are well over seventy bunkers on the course plus attractive water features, all adding to a serious test of golf and, situated a mile above sea level allows even the shorter hitters to find another ten yards of length off the tee. Situated between the Gatharaini River to the north and a large coffee plantation to the south, the course at Windsor is set out on pleasantly rolling terrain. Except for the opening and closing hole on each nine, the fairways are all tree-lined, with the next hole only ever revealed on arrival at the following tee. Mercifully, water is used sparingly as a hazard on the course and its most prominent appearance is found at the 420-yard 18th, which plays to a peninsula green. The trees suffocating the entrance to the green on the first hole gave me some cause for concern but any fears that the remaining holes might also be unfairly restricted were quickly dispelled on the second hole, a terrific par four that plays across water before doglegging downhill to the green. This thrilling start sets the tone for the round, with fairways playing along shelves, sweeping uphill or doglegging downhill in a wonderful woodland setting. The 388-yard 6th is one of the more memorable holes on the front nine, veering right off the tee towards a heavily contoured green. On the inward half, I loved the narrow, downhill par three 13th, situated on the edge of the coffee plantation and it’s followed immediately by a quirky risk/reward par four 14th, where only the brave (or the foolish) will attempt to go for the two-tiered green in two blows. Laid out by Northern Irish architect Tom Macaulay, who worked closely with local designer Tommy Fjastad on this project, the course is beautifully bunkered, with each and every trap perfectly positioned to protect par. This was my first experience of playing in Kenya and it far surpassed anything I might have expected beforehand. The clubhouse is more grand hotel lobby than comfy post match snug but it’s ideally set up to cater for the large numbers of visiting golfers that come to play here.